Thirty one years after the United Nations Convention Against Torture and Other Cruel, Inhuman or Degrading Treatment or Punishment came into effect, the legacy and practice of torture remain pervasive in conflict and post-conflict settings across Asia. Weak legal and judicial systems stand in the way of holding torturers accountable. Torture victims face compounding barriers due to inadequate social safety nets and limited reparations programs for the torture that they suffered. The states’ refusal to acknowledge sexual and gender-based violence is also a major obstacle to accountability and healing for victims of torture, particularly women. The failure to address past forms of torture contributes to an ongoing situation of impunity that has allowed torture and violence to thrive, even in societies transitioning to democracy. Torture has become embedded within the state security apparatus. Forms of violence and ill-treatment have seeped into and have been normalized by societal culture. As such, AJAR believes that only a broad-based movement that strongly rejects the use of torture in any circumstance can counter the norms of torture and impunity that exist in post-conflict settings in Asia. Over the years, AJAR’s work on addressing torture included training and empowerment workshops with torture survivors, public campaigns, policy papers submitted to UN human rights mechanisms, and participatory research that included documenting the stories of torture survivors in several Asian countries. Through the support of the United Nations Voluntary Fund for Victims of Torture, AJAR has supported victims of torture in four countries in accessing medical, economic, and legal assistance. 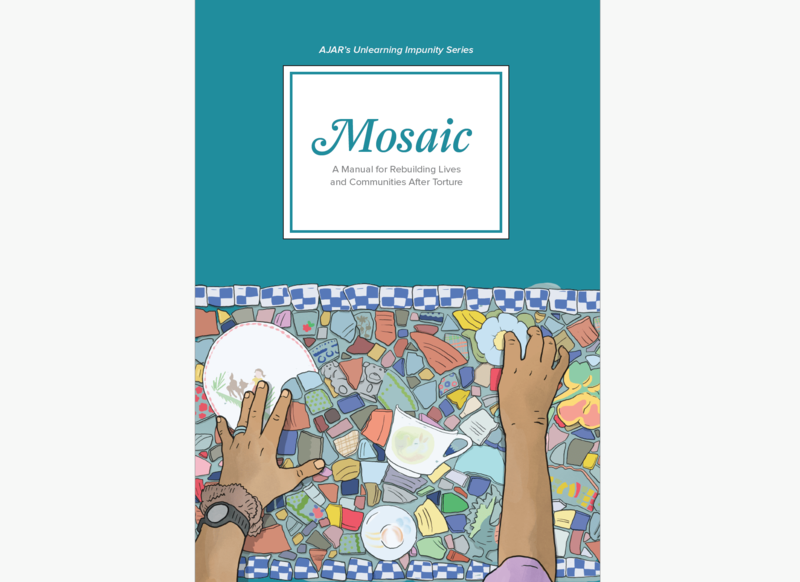 Today, in honor of the International Day in Support of Victims of Torture, AJAR presents its manual “Mosaic: A Manual for Rebuilding Lives and Communities After Torture.” Mosaic sets out clear methods for participatory work with victims/survivors of torture and their communities, including guidance on developing effective strategies for advocacy campaigns, seeking justice, legal aid, and psychosocial healing for victims.